If a Londoner wanted to visit a museum where he or she could study the bones of animals of nearly every shape and size, chances are the Natural History Museum in South Kensington would come to mind. The problem is that every other fan of the natural sciences will head there too – often with screaming children in tow. 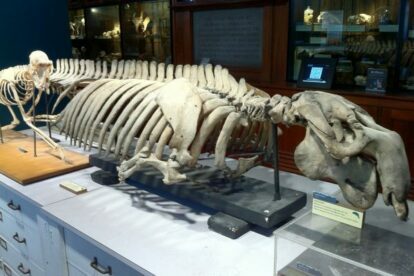 For the more serious-minded fan of stuffed animals and elephant skulls, the Grant Museum of Zoology is the more appropriate (and much calmer) choice. This centrally located museum is more compact than the Natural History Museum, but I find myself spending more time studying certain displays without the need to rush along to the next exhibit. Along with the usual skeletons of monkeys or cats, there are more quirky displays that show the richness of the 67,000 specimen collection. Keep an eye out for the dodo and the Tasmanian Devil. The jar of tiny moles is also a strange but oddly intriguing sight. The museum also provides a number of events (most of them free) for the intellectually curious, including lectures, films, and Q&A sessions with curators.